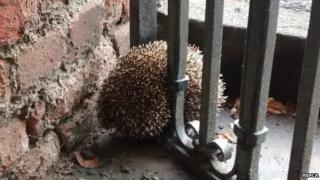 A hedgehog who misjudged his own girth was rescued by firefighters after becoming wedged between railings. The hedgehog found himself in a tight squeeze when he tried to negotiate the gate on Old Station Road in Newmarket, Suffolk. Firefighters were called to bend the bars and release the animal. The RSPCA said it thought the animal, which has now been returned to the wild, may have got trapped because hedgehogs are short sighted. The animal was spotted on Sunday morning but it is thought it became stuck overnight. "It is hard to imagine how this little thing got himself into such a tight squeeze," Inspector Richard Lythgoe said. "I can only imagine he misjudged the width of the bars, or perhaps did not see them clearly as hedgehogs are short-sighted. "He was so firmly wedged in between the bars of this gate that the fire crews had to completely stretch them to get him out, and even then all his little spines were squashed down." Despite being an experienced animal rescuer, Mr Lythgoe said releasing the hedgehog without the help of Suffolk Fire and Rescue officers was beyond his abilities. "They did a brilliant job," he said.